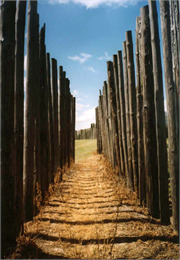 Aztalan mound seen through the reconstructed palisade. In the last decades before the dawning of the second Millennium A.D., Late Woodland descendants of the Effigy Mound culture built a small village on the banks of the Crawfish River in what is now Jefferson County, Wisconsin. The little village sat on gently sloping ground, near a spring that emptied into the river. Two high hills, dotted with centuries-old burial mounds, overlooked the site from the east and west. We know the inhabitants of this village probably lived in oval pole wigwams covered with mats woven out of river grasses and reeds. They hunted deer and other game and fished in the river. They also grew some corn in fields north of the village. Though they lived primarily on the west bank of the river, they may have built two simple earthen enclosures on the east bank. This line of conical mounds sits on the hill overlooking Aztalan. 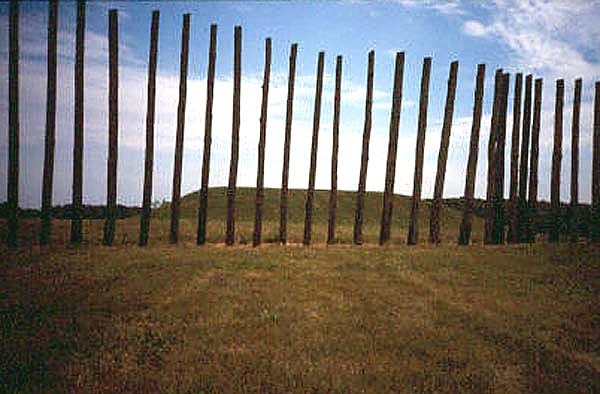 The conical mounds did not contain burials, but were built over the former locations of large wooden posts. Around A.D. 1000 this village became the site of a remarkable happening. Visitors arrived from the south. They, or their immediate ancestors, hailed from the city of Cahokia — a massive complex of temples, plazas, ritual and residential precincts surrounded by satellite villages and religious centers located near modern East St. Louis. 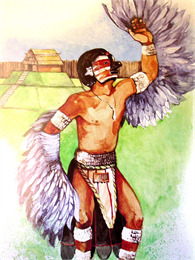 Cahokia was like nothing that had ever been seen before in the mid-continent. 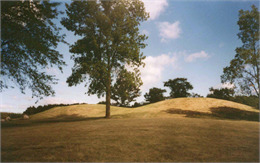 Its rulers lived on the top of Monks Mound, a 100-foot-high artificial earthen platform that dominated downtown Cahokia. 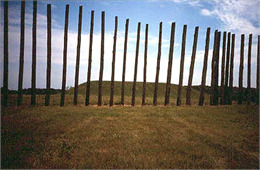 Monks Mound and a series of smaller platforms, temples and burial mounds ringed a gigantic plaza, and were in turn enclosed by a wooden palisade wall studded with defensive bastions. Other, smaller groups of platforms, plazas and palisades, as well as workshops, residential areas and cornfields, extended out in all directions. A narrow-walled corridor, once guarded by lookouts stationed in bastions. 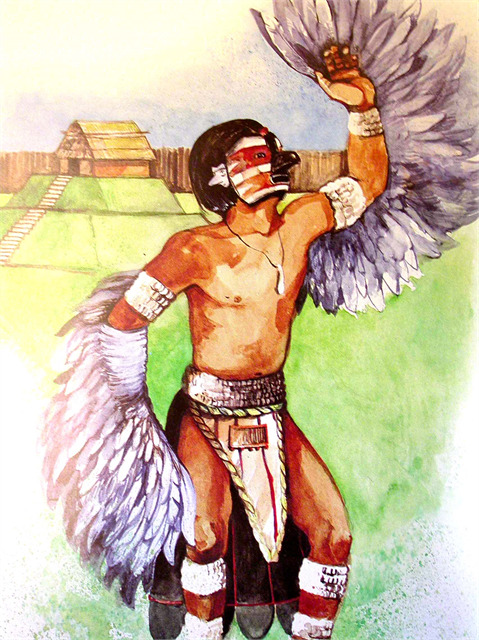 As Cahokia increased in size and power, small groups of colonists or dissidents broke away and established villages in central and northern Illinois, bringing their Middle Mississippian culture with them. Traders moved northward up the Mississippi and Rock rivers into Wisconsin. We may never know why one group decided to settle in the small village on the banks of the Crawfish. Perhaps they were invited. Perhaps they had already established ties to the community through marriage or trade. Perhaps they offered power and prestige. What we do know is that they brought sweeping changes with them. In short order, the small village was expanded and remade into a miniature version of Cahokia. A plaza was cleared near the center of the site. Three earthen platforms were built on the west side of the river. One supported a charnel house, where the corpses of the dead were processed for burial. The second and third supported structures that may have been houses or temples. 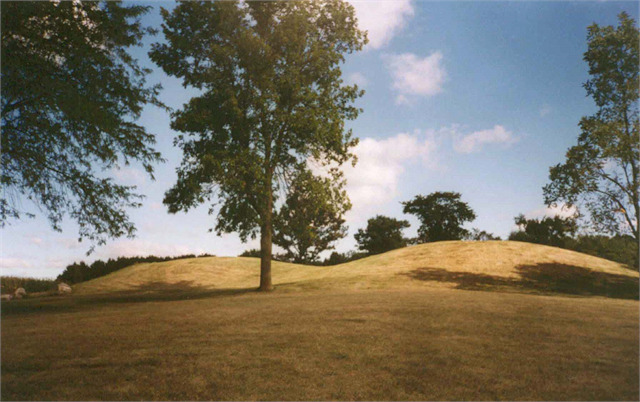 A natural knoll served as a fourth mound that was used for burial purposes. The four mounds formed a rectangle surrounding the main village and plaza. 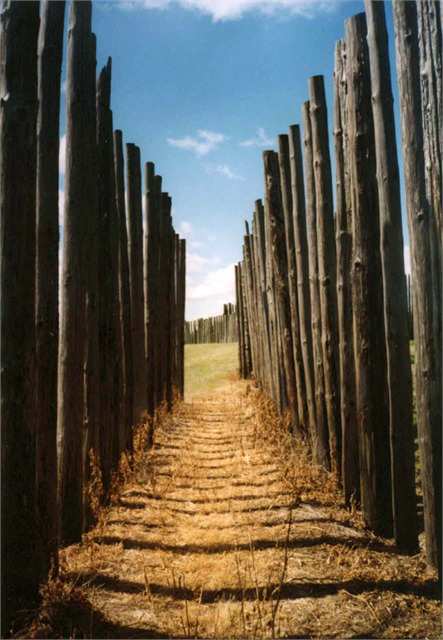 A series of bastioned wooden palisade walls enclosed the site on all four sides, and even separated areas within the village from one another. These walls were covered with fired clay, and were supported by an embankment formed partially out of broken pottery, crushed bone, and other village debris. The newly remodeled village would certainly have impressed local visitors, but would have easily fit underneath Monks Mound with room to spare. Two other platform mounds were built in the simple enclosures on the east bank of the river. To the west, a row of dome-shaped mounds, each covering the base of a large wooden post, was built on the slope above the village. Corn fields stretched northward from the village walls. The inhabitants of the village lived in new rectangular and circular houses built of wooden posts and walls woven out of flexible branches and covered with clay daub. These houses were built both inside, and outside, of the main palisade walls. The inhabitants of the new settlement imported ritual objects and luxury goods from Cahokia, and probably from the Middle Mississippian settlements in central and Northern Illinois. They also traded with groups in western and northwestern Wisconsin. We do not know if many trade items were sent back to Cahokia or the villages in Illinois. Very few raw materials from Wisconsin have been found in either place. The new settlement may have exported deer hides or other perishable materials to these areas instead. As time passed, Middle Mississippians and Late Woodland peoples intermarried, and their cultures began blending together. Mississippian ideas and technology spread across Wisconsin, and may have been responsible for transforming Woodland cultures into the Upper Mississippian Oneota. Still, culture clash must have been present. The Middle Mississippians lived within a highly ranked social system that celebrated valor in warfare, quite unlike their relatively peaceful, egalitarian neighbors. The village seems to have thrived for at least 200 years, though there is disquieting evidence that some violent practices may have traveled north with the settlers as well. The village was abandoned, for reasons unknown, around A.D. 1200. Its clay walls burned and crumbled, the houses fell, and nature reclaimed the site. When Euro-American travelers stumbled across it in the early 1800s, their first accounts were so spectacular that eastern newspapers speculated the stories were a hoax. The site was initially, and mistakenly, identified with the mythic homeland of the Aztec civilization of Mexico, giving it the name it bears today — Aztalan.